The Noll-Scully metric is used for measuring competitive balance in sports. 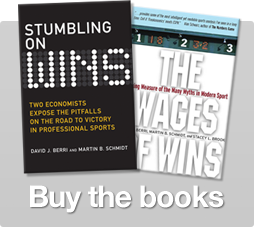 As James Quirk and Rodney Fort put it in Pay Dirt — this metric (developed by Roger Noll and Gerald Scully) “compares the actual performance of a league to the performance that would have occurred if the league had the maximum degree of competitive balance (in the sense that all teams were equal in playing strength)”. The average number of wins per team. Based on these three things we can determine what an ideal league would look like. Important Side Note: An ideal league is not one where every team wins the same number of games! We’ll jump more to that in a second. The Noll-Scully compares what a league actually looks like to what it would ideally look like. In a perfect world — i.e. one where actual balance matches the ideal — the metric would return a 1.0, meaning the league is balanced. If the number is above 1.0 it means the teams are further away in wins than we would expect given the ideal. If the number is below 1.0 — and we should stress this is hardly ever the case — it means the teams are closer in wins than we would expect. If you’d like the full steps for Excel you can find them here! We begin with the standard deviation of wins. In statistics the standard deviation essentially tells us how spread out our data is. We’ll first figure how spread out wins should be based on the league size and number of games and then compare that to reality. It’s not so bad I promise! First calculate the Idealized Standard Deviation. Ok here’s where we figure out what things should look like. First we’ll take the average number of wins each team has. For most leagues this is pretty simple, just take the number of games each team plays and divide by 2. For hockey or soccer you have to take the average number of points, which is a little more work but still pretty easy. NFL: Most teams should be between 6 and 10 wins. if your numbers were in first 30 rows of column A and you’ll get the standard deviation. If not I’ll let you run over this quick tutorial for figuring out standard deviations. Take your time, I’ll be here when you get back. The final step is the easiest. Just take your real standard deviation and divide it by the Idealized Standard Deviation. The closer it is to 1.0 the more competitively balanced your league is. As we can see, hockey and football are fairly balanced. Baseball starts to have some lopsidedness but is still not terribly unbalanced (and it is much more balanced than it was in the early part of the 20th century). Basketball however is wildly unbalanced, which is of course a major subject in the book Wages of Wins and a popular subject on this blog. Hope the tutorial helps and you understand why the Noll-Scully is used in explaining competitive balance and how to interpret it. David, I think your “quick cheat” Excel method for calculating the standard deviation should use “stdevp” (standard deviation of the population) rather than “stdev” (standard deviation of the sample). At least, this seems to be the method that Leeds von Allmen use in their textbook depiction of the Noll-Scully method. Is it possible to calculate this over several seasons? it is certainly possible to do this over several seasons. At least in theory, one could add up the wins of each team and calculate the actual and idealised standard deviations over time. I tried this once with (Australian Rules) football and got indices in one league (the WAFL) as high as six time the ideal over a ten year period in the 1940s and 1950s. I am not sure, though, that this is an accurate method on second thoughts, btu still try! The link for the step by step to figure out Noll-Scully in Excel doesn’t work. Can you repost it again please? For calculate the actual standard deviation, use the perfomance % of all the parts involved at the competition. Next, divide the actual SD by 1. This is useful for non-round robin tournaments, like the FIFA World Cup, tennis tourneys (via sets/games coefficients), etc. And even for including play-offs in any major American league equation. Excuse me, the division actually is by 0.5. One experiment I have done recently is to try to compare leagues with a “perfectly unbalanced league” in which the outcome of each match is known perfectly beforehand. It has a relative standard deviation of twice [K(N + 1)/12]^0.5, where K is the number of times each team plays each other. K is equal to n/(N-1) where N is number of teams and n number of games. What comparison with a theoretical perfectly unbalanced league reveals is that (Australian rules) football may be less competitively balanced even than NBA basketball, which is not surprising given that the large land areas to play the sport are not available in the northern or western hemispheres, so the talent pool has never been large. Added to this is the very high scoring which creates high resolution of differences in team qualities, and one sees cases where the standardised index is as high as 0.70 is many seasons and in a few as high as 0.89, whereas the NBA is only halfway to a perfectly unbalanced league. It may be that, because either scoring is too low or procedures prevent one team from monopolising scoring (as in basketball), along with the much higher number of games per season in soccer and most American sports compared to Australian rules football, the concept of a perfectly unbalanced league has little appeal to most people in the northern and western hemispheres.